It's a place called Hasslingåfallet in the north of Sweden, Jämtland county, near the village Hotagen. Jämtland (Swedish pronunciation: [ˈjɛmtˌland] ( listen)) (Latin: Iemptia) or Jamtland (Jamtish: [ˈjamtˌlanː]) is a historical province (landskap) in the center of Sweden in northern Europe. It borders to Härjedalen and Medelpad in the south, Ångermanland in the east, Lapland in the north and Trøndelag and Norway in the west. 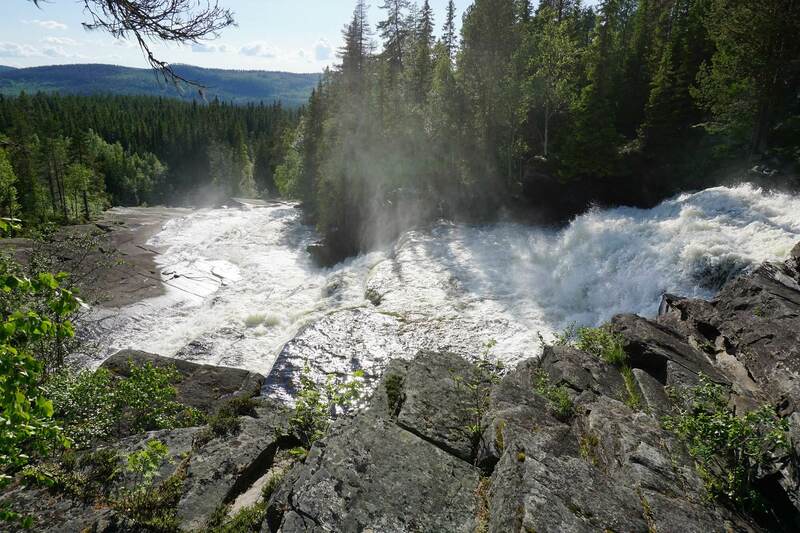 Jämtland covers an area of 34,009 square kilometres, 8.3% of Sweden's total area and is the second largest province in Sweden. It has a population of 112,717, the majority of whom live in Storsjöbygden, the area surrounding lake Storsjön. Östersund is Jämtland's only city and is the 24th most populous city in Sweden. Jämtland was originally an autonomous peasant republic, its own nation with its own law, currency and parliament. However, Jämtland lacked a public administration and was thus best regarded as an anarchy, in its true meaning. [clarification needed] Jämtland was conquered by Norway in 1178 and stayed Norwegian for over 450 years until it was ceded to Sweden in 1645. The province has since been Swedish for roughly 370 years, though the population did not gain Swedish citizenship until 1699. The province's identity is manifested with the concept of a republic within the kingdom of Sweden, although this is only done semi-seriously. Carl XVI Gustaf became the Duke of Jämtland after his christening, a nominal title he still retains.